Over the past several years, many corporations have successfully completed numerous strategic Business Process Management (BPM) initiatives. Looking to build and expand upon these successes, many practitioners realized that connecting and integrating the individual models from strategic BPM initiatives could identify additional performance improvement opportunities and synergies between the previously modeled core cross-functional business processes. Bearing in mind that activities integrate individual tasks, processes integrate activities, strategic BPM initiatives integrate processes, and then continuing with this rationale, one realizes the Business Architecture (BA) integrates all core cross-functional business processes from the strategic BPM initiatives. The Business Architecture, while different in intent and purpose, seems a natural extension of BPM. This newly developed enterprise wide Business Architecture allows one to clearly understand the fit among activities in order to improve performance, increase profitability, delight customers and achieve a competitive advantage. When the core cross-functional business processes are connected, linked and integrated into a formal Business Architecture, it provides additional insights into the analysis of proposed corporate initiatives for inclusion into the enterprise strategy. And this synergy between the two methodologies is a good thing. But how does one communicate between the two domains of process and architecture and what is the mechanism that enables a “transitive link” between the two domains? Just remember that while the two domains share the same corporate DNA, the business process is a dynamic model illustrating the transformation of inputs into outputs, while the Bushiness Architecture is a static model illustrating the formal relationships, connectivity and linkages between all business processes. The business processes are the structurally integrated components. These two domains are NOT merely juxtaposed, but empirically integrated. One can place containers of water, bags of cement and piles of bricks in very close proximity to one another, but one does not have a wall; you have to properly integrate the components in order to have a structurally sound and useful wall. A formal means of communication between the domains of process and architecture is not generally accepted. However since May of 2004, the first release of the Business Process Modeling Notation (BPMN) has provided the means to graphically model and communicate the intricacies of business processes between business and technology professionals, but a similar notation for Business Architecture does not exist. Oh, many BA practitioners have accepted the BPMN as a “de facto” standard, but until the release of the Business Process Modeling and Notation (BPMN) 2.0 in January 2011, the earlier releases of BPMN had limited applicability for Business Architecture Modeling. One of the new features that made this sharing possible was stated in the BPMN 2.0 Handbook, Second Edition: “Data becomes a first-class part of Process modeling in BPMN 2. Inputs and outputs are visually specified for Processes and Activities”. This “data” – the inputs/outputs – are what formally and visually connect one value stream/process with another to form, collectively, an enterprise structure. This BPMN 2.0 feature provided the ability to formally integrate business processes into a Business Architecture. Now, one can illustrate the integration of structural components - the business processes - in a precisely engineered model similar to the existing business process models. In light of this new feature, this article asks the question: “Is it possible for both the business process and Business Architecture Modeling approaches to share a common modeling language and might BPMN 2.0 satisfy both?” The author of this treatise has explored and analyzed BPMN 2.0 for use in Business Architecture Modeling and has concluded that BPMN 2.0 meets the most basic requirements for a shared modeling language between the two approaches. And with this conclusion, there is no reason to purchase additional software to support Business Architecture Modeling beyond what the enterprise already uses for business process modeling. While this was not a stated intention of BPMN 2.0 development, it is characteristic of the evolving nature of BA and its “transitive link” to the business processes. 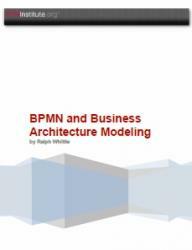 The results are presented in a 19-page article that is richly illustrated with 17 diagrams and figures, providing examples of how to employ BPMN 2.0 for Business Architecture Modeling. It is hoped that the reader will analyze this article and investigate the possibility of using BPMN 2.0 as the notation for Business Architecture Modeling. Examine the analysis provided in the full article. For a quick look at the results of using BPMN 2.0 for Business Architecture Modeling, just click on the embedded link to see an example for a generic build-to-order manufacturer. Please use Internet Explorer as the navigation and hyperlinks are configured for this browser; other browsers do not support the navigation and hyperlinks. Just by clicking on any element in the Web site model, the reader may examine the core cross-functional business processes or value streams with their various inputs/outputs along with their sources and destinations. All elements in the model have a more detailed model available for review and each and every value stream is connected or linked to the other value streams or external entities by the inputs/outputs exchanged. A little more detail is provided for the Order to Cash Value Stream for illustrating how to connect, link and integrate the Business Architecture Models with the business process models. Robert Shapiro, et al., BPMN 2.0 Handbook Second Edition Digital Edition (Future Strategies Inc., 2012), page 28. Download at http://www.bpm-guide.de/wp-content/uploads/2011/09/BPMN-2.0-Handbook-Camunda.pdf .